Transitional design is the marriage of contemporary and traditional design. 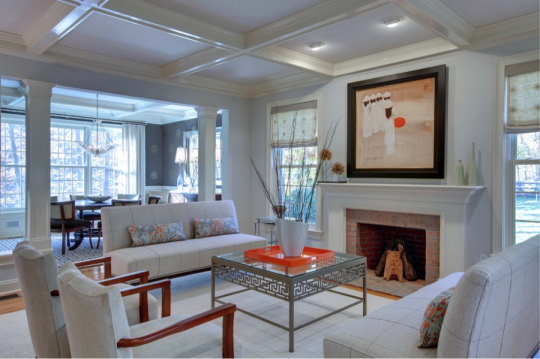 In transitional homes, the design is often clean and refreshing, while still remaining warm and inviting. This style of home design is great for homeowners who appreciate classic elements of home building, like crown molding, but want a more modern effect. Transitional color palates represent a clean and calming atmosphere. Picture cool blues, greys, and whites, accented by carefully picked accessories. Since the minimal color scheme allows for more freedom with fabrics and furniture, expect to see unconventional fabrics like corduroy, pliable leather, and chenille. Furniture is often curvy and large in size, but not traditionally “grand” in it’s presence. With the lack of decoration in transitional homes, the spaces are free of distraction and have an open layout. Where lines in contemporary homes are often straight and stark, transitional homes have a bit more freedom of flow.